Thank you to everyone who left considerate comments on the previous post. The past week was not exactly normal but this is not surprising. Events like this do act as a short, sharp, slap into the realities of life and death. My commiserations really go out to my workmate's immediate family and his past partner who are far more affected by his sudden loss than I was. I must say that my workplace was very supportive - they offered counselling if I needed it (which I don't - at least I don't think so) my Department Head sent a lovely, considerate email, (dashing all my cynical preconceptions about heartless bosses) and numerous people have approached me to see 'how ya going'. I'm not used to all this attention but really do appreciate it. Knitting was a nice mindless routine to lose myself into so I've made a reasonable amount of progress on Cobblestone - I love this 10ply crepe (Bendigo?) 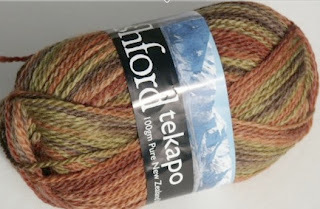 yarn - it is such a reliable workhorse and provides a consistently good result. Coming from a anonymous market stall gives it a reincarnated quality that will make the finished garment just that little bit more special. I have also joined ISE5 and as usual, am in a quandary about which scarf to knit. I thought had it all sussed but a big ball of Ashford yarn distracted and tempted me from the lace weight path I was about to go down. There are memebrs of ISE5 that have already finished their scarves and proudly display them to the procrastinators like myself. Today's trip to R&L knitting group also helped redress the imbalance of the past week. Pamela bought along the lovely swag of yarn goodies her husband brought on a recent trip to Japan so there was admiration and appreciation all roiund. A good dose of knitting chatter in a room full of yarn and accessories is like a big swig of oxygen to the brain. Glad you're surfacing and have had the balm of knitting and knitting friends around you.